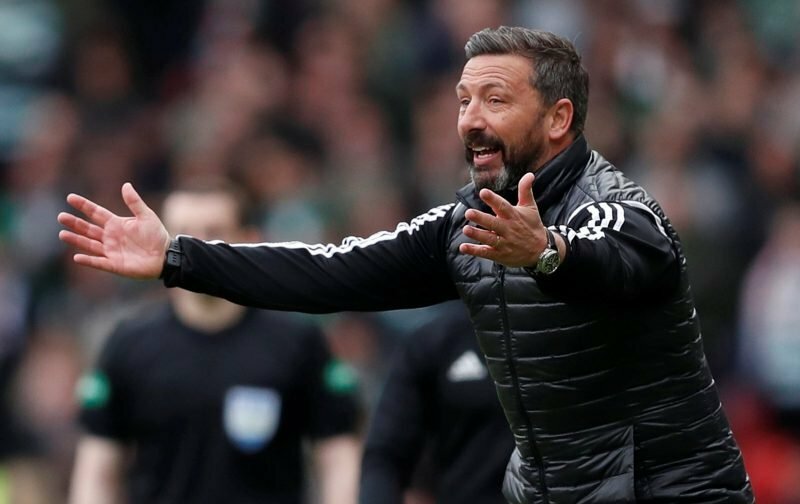 Derek McInnes has revealed that he was responding to a sectarian chant from Celtic fans when he was ordered from the technical area at Hampden during Aberdeen’s 3-0 defeat. Midway through the second half the Dons boss was given a distant dismissal by referee Craig Thomson presumably to the advise of fourth official Nick Walsh. “I got send off because of my reaction to the Celtic support,” he tells BBC Scotland. “I shouldn’t react and I accept that and apologise for that. Later on during the general media conference the story took a new twist when McInnes was asked if it had been a reaction to sectarian abuse from Celtic supporters. The Dons boss then went into some detail which he hadn’t mentioned during his Radio Scotland interview. At Hampden, McInnes was in front of the South Stand which was split 50-50 between both sets of fans with no sign of any sectarian singing. Over in a small area of the North Stand there was a muted attempt at the Cheer Up song but it was ignored by most Celtic fans as they revelled in their side’s performances in booking a place in the final of the Scottish Cup. Scottish football has been dogged by various supporter problems this season ranging from fans being on the park, pyro and firecracker/fireworks being thrown as well as sectarian singing. The Scottish Government and Police Scotland have made statements in recent times about these incidents with little sign of clubs or the football authorities being prepared to tackle the issues. With the issue flaring up again and reaching a UK wide news agenda it seems certain that action will be taken with clubs and fans likely to suffer the consequences.